Home » Greenroom » Do You Smell the Sweet Smell of Success? Do You Smell the Sweet Smell of Success? Fragrances can play an important role in enhancing the productivity levels at your workplace. No one recognises this better than the Japanese. They have been at the forefront of using aromatherapy at work to energise their employees and increase efficiency of the workers. From the uplifting scents of lemon wafting through the air-conditioning ducts to the refreshing minty scent perking up employees after lunch at the Tokyo Stock Exchange, the Japanese have made a science out of it. Do you want to make it work too at your workplace too? The Oxy-Gen Air Freshener from Alsco is what you need. Call your friendly Alsco representative to know about the cost effective, fully managed rental solutions that we have to offer and get your own free quote too. Olfactory sensitivity is important to the enjoyment of food, evaluations of whether the surroundings are clean and well maintained. While foul-smelling air is not necessarily unhealthy, the sheer unpleasantness of an odour can initiate symptoms such as nausea, headache, and loss of appetite. The stronger the odour, the more intense the symptoms. Even a mild but recognizable odour may arouse uneasiness among a room’s occupants. Discomfort in occupied areas may result from the intake of outdoor air containing automobile exhaust, furnace effluents, industrial effluents, or smog. Industrial spaces may have odours from chemical products, such as printing ink, dyes, and synthetics, as well as from manufactured products. Offices, assembly rooms, and other enclosed, densely occupied spaces can contain objectionable body odours and tobacco smoke. Odour may be removed from the air by physical or chemical means. One of the most popular physical methods is ventilation, which except for work spaces in mild to moderate climatic zones, add substantially to the heating or cooling needs. Hence, under many situations, it may be better to minimise ventilation. Chemical means on the other hand are generally unsafe. Aerosol sprays often contain harmful chemicals which are the cause of headaches, skin reactions and allergies. A study by researchers in Australia found that Volatile Organic Compounds (VOCs) cause headaches, depressions and may even cause asthma amongst babies. Go Clean While You Go Green! 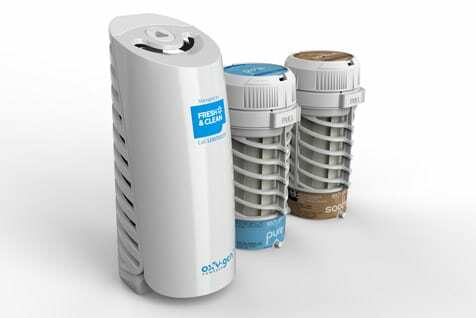 The revolutionary Oxy-Gen Air Freshener is the world’s first oxygen based dispenser. This means that your Oxy-Gen does not use harmful and toxic propellants, solvents and VOCs. The refill contains only pure, concentrated fragrance oil, around six times more than most aerosol refills. It can reduce the amount of VOCs emitted by aerosol cans by up to 90%. No other air freshener uses oxygen based delivery for its pure natural oil based aromas. To put it in simple words, it is safer, healthier and environment friendly. Not only will your workers benefit with the uplifting aromas, their health will not be affected. This means fewer sick days and less absenteeism and other health claims. Further, this technology can help offices reduce their carbon footprint and is ideal for LEED building certification. It uses the patented oxygen-based fuel cell technology, which is commonly used for precision drug delivery to deliver reliable, consistent and measured doses of fragrance. This medical grade innovation ensures that there is a continuous level of pure, natural scent in the air at all times. The Oxy-Gen Air Freshener does not just mask malodours, it actually eliminates them. When released, the fragrance molecules diffuse into the air in the room and push out the competing malodour molecules completely. It eliminates all kinds of malodours such as sweat, kitchen odours, tobacco, mildew and body odours. That is not all. There is more to this little pocket dynamite! Modern, compact, sleek contemporary design is soothing to the eye and ensures maximum air circulation. The design ensures maximum performance with minimum effort. Servicing is a breeze. Alsco service people will change the batteries on every service in a matter of minutes without disturbing your colleagues. The refills last 60 days when used at regular intensity. These are replaced for you at no extra cost. Choose from a variety of vibrant, invigorating and uplifting fragrances. We are confident that the Oxy-Gen Air Freshener is the one-stop answer to all your air-quality related questions and worries and are pretty sure that you feel the same too. Combine this with Alsco’s unmatched service and cost-efficiency and you would be smelling the sweet smell of success at your workplace. To get your hands on this exciting new product from Alsco for your workplace, get in touch with us at 1300 659 892.